Avoid any mix-ups on the playground with personalized bag tags – an essential for anyone in school, college, or even anyone about to embark on an adventure. Your leather bag tags are stylish and practical and can be printed on both sides with a full color permanent print. Each one is finished off with a buckled strap. Add a unique finish to any bag with your own personalized bag tags. These handmade genuine leather tags are particularly ideal for leather bag tags, or for those travelling or starting university. These strong and robust tags come complete with a black buckled strap so can easily be attached and adjusted to any bag – the buckle is sturdy and secure to ensure the tag will last for years into the future. These school bag tags can be printed on both the front and back with either the same or different designs, so you can make them totally unique to you. You can add text or a photo to ensure your bag stands out from the crowd. At 2.75" x 2.24" in size, it’s the perfect accessory for any bag or piece of luggage. Lovely Quality, clear printing on both items. Great customer service throughout the ordering and delivery process, I was kept informed of the time of dispatch which was quick in turn-round after placing my order. Really easy payment process and I would use them again and highly recommend to other customers. My print came out really well and the item itself was made very well. I am impressed with the quality and have ordered again after another request. Who Will Love These Personalized Bag Tags? We’re sure your little one will absolutely love their new custom bag tags to help give their bag a unique look and prevent any mix ups. 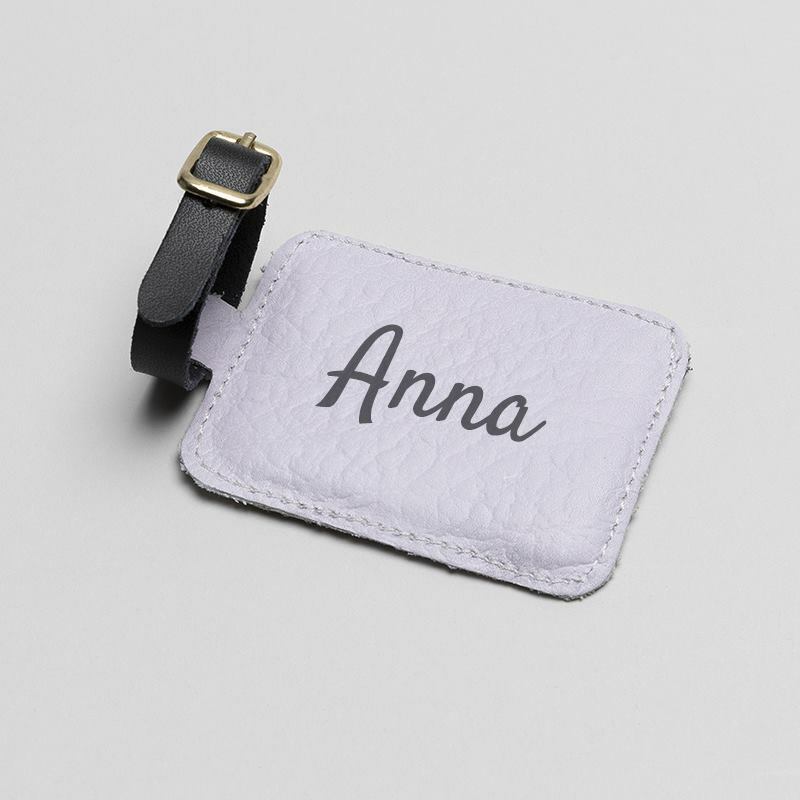 These tags are wonderfully versatile and can be used for almost any type of bag; whether you’re setting off on holiday and need a tag for your suitcase, or if you’re a keen camper and want to make sure your contact details can be easily seen on your bags. Design several personalized bag tags and get a generous quantity discount. Your new school bag tags are crafted onsite by our skilled makers. Your photos are reproduced onto high-quality genuine leather using a professional printing process, which locks eco-friendly printing inks directly into the fibers of the fabric. Every print is permanent, fade-proof and scratch-resistant, and printed with beautiful vibrant colors and sharp details. After this, the leather is cut and hand-sewn with a layer of neoprene in the center, to create the stunning finished product. You have a choice of charcoal, cream, red or blue thread. A black leather buckle strap finishes off the personalized bag tags, making it easy to secure safely to any piece of baggage. If you’re creating school bag name tags for your little ones, why not print one side with their name and school year, and print the opposite side with a recent photo of them? This will help hugely in case the bag ever gets lost and will prevent any classmates accidentally taking home the wrong school bag. Know someone embarking upon an adventure? Create a custom bag tag for them featuring a photo of a happy memory you shared together on one side, and their name on the other side. Help them feel at home even while they’re across the other side of the world. This personalized school book bag is perfect for standing out from the crowd. This unique bag is made from canvas and leather.